Subjects, styles, advertising, other relevant information: In the 1939 Register Winifred is shown as a photographic artist, retired. She was living with her brother, Thomas H W Clapton b: 8/4/1882, Clerk in Holy Orders at the Rectory, Fishers Lane, Orwell, Cambs. Also at the address were Olive M Clapton b: 1893, Maude M Clapton b: 1916, Edith N Robinson b: 1892 and Pauline D Robinson b:1925. Winifred Margaret Clapton aged 38 born Holloway London, was working as a photo re-toucher and living at "Sandringham" Park Road Hendon in 1911 with her widowed mother Margaret Anne b: 1842. In 1891 Margaret Ann, Winifred Margaret, Thomas H Clapton were all living at Cumberland Park Hammersmith. No trace has been found of the family in 1901. 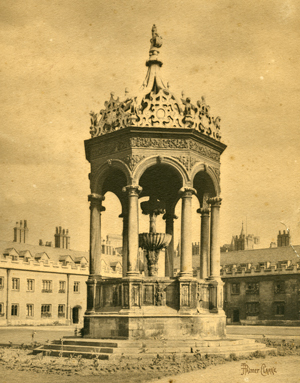 Subjects, styles, advertising, other relevant information: The only information gleaned so far about this Cambridgeshire photographer is that in 1866 he submitted two of his photographs to Stationers' Hall for copyright purposes. The photographs were of Kimbolton Cemetery from the north and Kimbolton Cemetery from the east. The copyright owner and author was shown as Joseph Clare Jnr, Kimbolton. TNA COPY 1/10/433. Joseph Clare was the son of a watchmaker of the same name. In 1861 Joseph Junior was living with his parents and four sisters in Kimbolton and he too was described as a watchmaker. By 1871 Joseph Jnr had married and moved to Sandy where he lived with his wife and two young daughters. His occupation was shown as silversmith jeweller and photographer. By 1881 the family had moved to Wales and were living at Abergavenny, Monmouthshire and Joseph was shown as a Watch Maker & Optician. 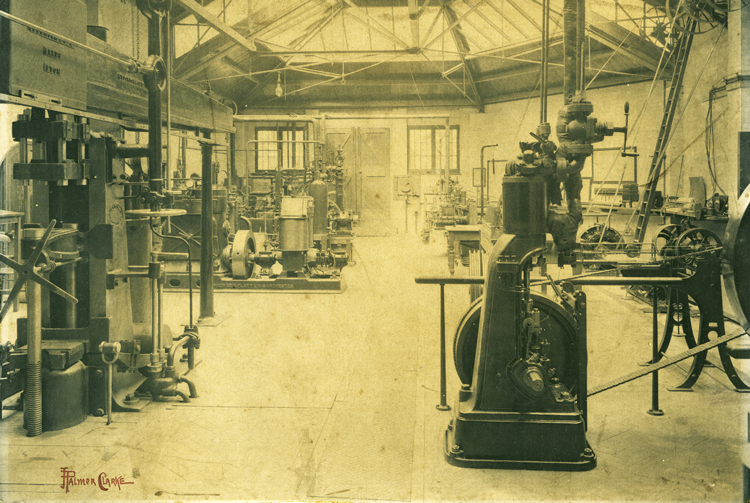 His growing family remained in Abergavenny in 1891 by which time Joseph was a watchmaker and photographic artist. 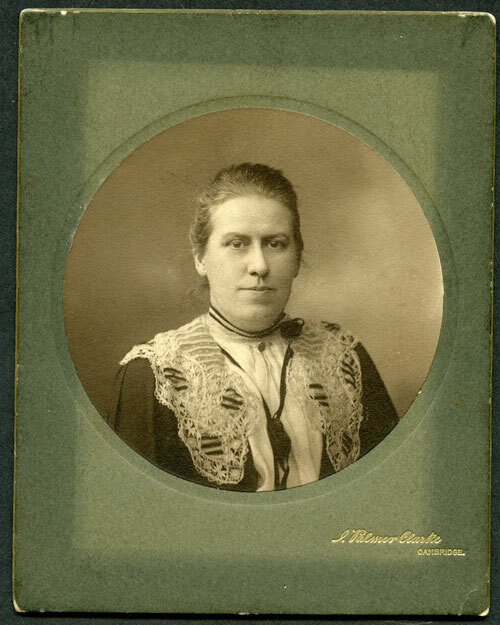 His eldest daughter, Lizzie Clare b:1869 Sandy Beds, was an assistant artist. References: For sale on Ebay, September 2018, a 35mm, positive, black and white filmstrip with 18 images - nudes / glamour shots, the filstrip had a code on one image "18/1-18 Series" suggesting this was one of a number of products. One frame of the filmstrip was a notice "Produced by the Clare Studio, Abington, Cambs Copyright" . The item was described as around 1960 vintage, which is probably a good estimate . The seller had no knowledge of its provenance - having bought it in a large box of postcards & mixed ephemera from a Bristol auction house. Not known at this stage if this studio was at Great or Little Abington. Subjects, styles, advertising, other relevant information: Printer and stationer St Ives - publisher of postcards with local views using his own photographs. At the Norris Museum St Ives, PH/S.IVE/Broadway/11 is a postcard view of the Victoria Memorial St Ives which bears the legend on the reverse "Photographed by John G Clarke printer & stationer St Ives". PH/S.IVE/Waits/24 is a postcard of The Waits in snow, with “Photo by J.G.Clarke St Ives Copyright” printed on reverse. 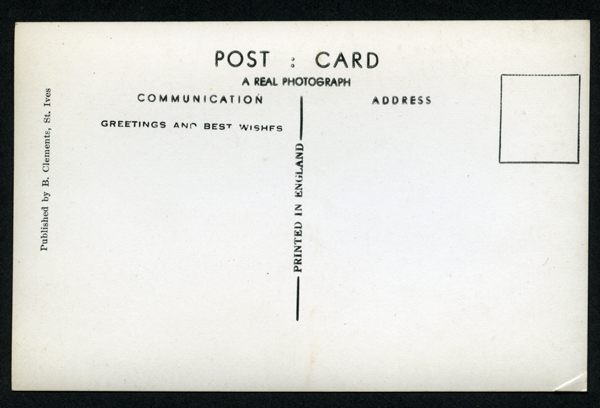 PH/S.IVE/Miscell/02 is an image of the smallpox isolation caravan – an old railway carriage in a field, 1904, on the reverse is printed “Photographed by John G.Clarke, printer and stationer, St Ives, Hunts”. John George Clarke appears in the 1891 census, living with his family in the Broadway St Ives where he was a bookseller and stationer. In the 1901 and 1911 census he is listed as a printer and stationer, living with his wife Harriet b: 1857 St Ives and two daughters, Mabel F Clarke b: 1890 St Ives and Kate Elizabeth b: 1894 St Ives. In 1911 Harriet and Mabel were assisting John in the business. References: England census 1891, 1901, 1911. Address: Bury St Edmunds, Post Office Terrace, Cambridge. Subjects, styles, advertising, other relevant information: The Clarke family were photographers in Bury St Edmunds from the 1870s. John Palmer Clarke was in the business in the early 1880s. He is listed in the 1891 census as a photographer at 7 Angel Hill Bury St Edmunds, where he lived with his wife Mary Emma. Clarke took over the business of Colin Lunn, formerly Valentine Blanchard and Lunn, in 1893 at Post Office Terrace, Cambridge. By 1895 Charles E Goodrich was listed as the manager of the firm. By 1901 the business was being run by Charles E Goodrich and Frederick Sanderson. On the night of the 1901 census John Palmer Clarke was in the Waverley Hotel Bloomsbury London. At the same hotel that night was Charles E Goodrich. Both are listed as photographers, suggesting that Clarke may have still been actively involved with the Cambridge business. The 1911 census shows John Palmer Clarke as a photographer, an employed worker, rather than an employer, living at 13 Glasslyn Road, Crouch End N with his wife, son and three daughters. The Post Office Terrace business continued in the name of John Palmer Clark until the 1930s when the Post Office Terrace studio was taken over by Ramsey and Muspratt. . 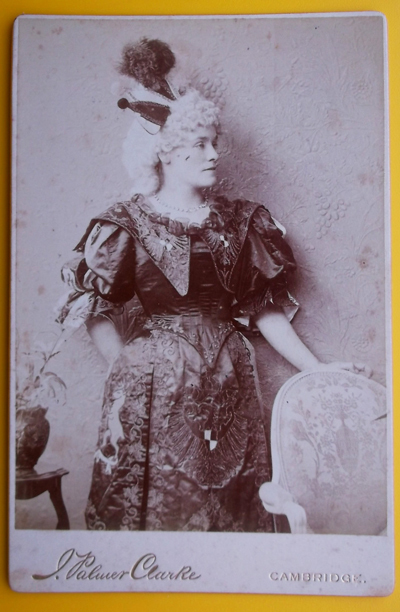 The first image below, from the Simon Shirley Collection, is a cabinet photograph of an unknown actress dressed in an elaborate silk dress with heraldic elements in the design, a curly blonde wig and a misthol or jester's hat, probably from the 1890s. Or this may not be an actress but someone dressed for a pageant, tableau or fancy-dress event. The face of the mount has the printed and impressed legend "J Palmer Clarke Cambridge". The rear of the mount is blank. Below are some examples of the work of the firm outside the studio. The first is an interior of a works or possibly a department of the University of Cambridge, the print measures approximately 10 x 8 inches on a plain card mount, but a signature in red ink appears in the bottom LH corner. The other two shots are both 10 in x 8 in mounted on plain card, of Trinity College Great Court and the interior of Clare College Chapel. 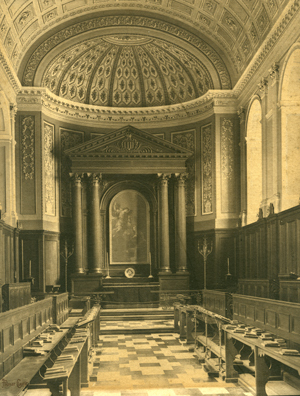 The Chapel interior has been dated by the Clare College Archivist, Alexandra Browne, to approximately 1910. 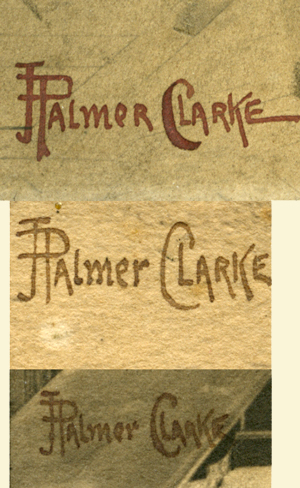 The fourth photograph shows details of the hand drawn stylised signatures on the three prints - clearly this continued as a signature beyond the period when Clarke was personally actively involved in the business. Next is a portrait dated 1907 signed H.Lambert, image 2.5 x 3.5ins, mount 3.25 x 4.75in, mounted on heavy brown card mount with gilt chamfered edges and impressed gilt text on the face "J.Palmer Clarke Cambridge". The reverse is blank. 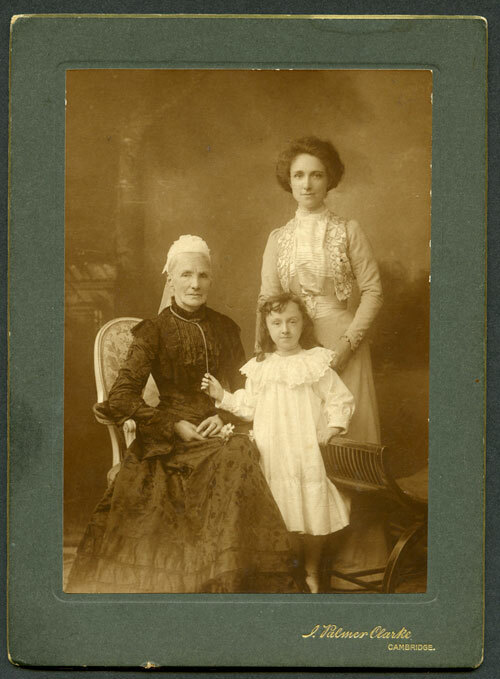 Below this is a group photograph, perhaps from around 1900, of three generations of female, on a 7in x 5in dark green mount with gilt chamfered edges and impressed gilt text on the face "J.Palmer Clarke Cambridge". Next is a circular potrait of a lady wearing an elaborate lace collar, on a dark green mount 6.5in x 5in with gilt chamfered edges and impressed gilt text on the face "J.Palmer Clarke Cambridge". This has in manuscript on the reverse, "R.M.Wiliams", and from the listing of surviving Palmer Clarke negatives, this would appear to be a portrait of Miss R.Williams 9 Victoria Park, Cambridge (PC negs 311/14 and 311/15), and again is from around 1900. The mount has a faded central rectangle, probably from inclusion in an album with a rectangular window. Cambridgeshire Collection’s Carte de Visite Collection c.65.5 has a carte de visite and three cabinet photographs from this firm. Numerous negatives survive in the Cambridgeshire Collection, deposited later from the firm of Ramsey and Muspratt. Cambridge Evening News 1 March 1923 - 100 years ago, J.Palmer Clark took over PO Terrace Studio from Colin Lunn. Subjects, styles, advertising, other relevant information: Listed in 1858 as "Photographer and dealer in every description of photographic apparatus, High Street Chatteris"
Subjects, styles, advertising, other relevant information: An out of county photographer operating on the county border in Northants. References: In the Norris Museum collection, PH/EASTN/24 is a photograph of the interior of Easton parish church, mounted on board, 160 x 200mm, written on reverse “Easton Church Hunts, by H.Clarkson, Thurning, Near Oundle" Herbert was the son of a butler. In 1891 he was working as a footman at the same place as his father at 61 Eaton Place Belgravia. By the time of his marriage in 1899 Herbert had himself become a butler and was living and working at the time in London at 25 Alma Square, London. 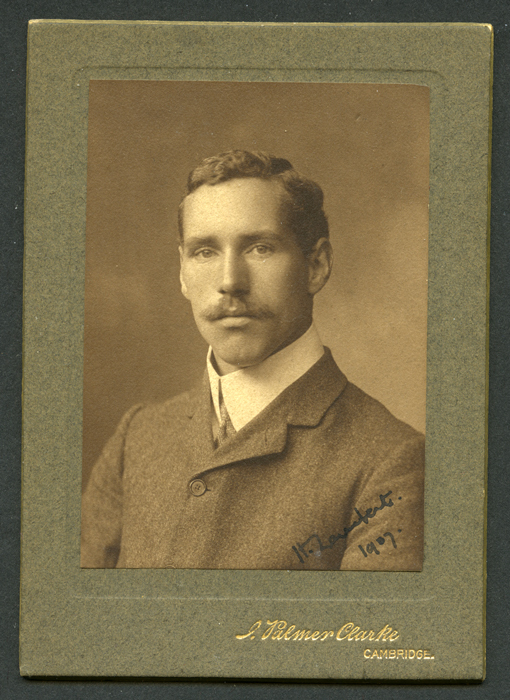 Herbert is listed as a photographer in Kelly's Northamptonshire 1910 and 1914. In the 1911 Census Herbert was a photographer living at Thurning, near Oundle with his wife, Rachel b: 1875 Hemington, Northants and daughters Emma b:1900 Hemington and Margaret b: 1908 Thurning. Subjects, styles, advertising, other relevant information: The Cambridge Evening News, 19 Sept 1991, reported that photographer Lesley Harper of Classic Photographic of Histon and Fulbourn had just completed a prestigeous project producing detailed photographs of a representative US pilot involved in the Desert Storm operation. She took over 400 photographs to be used to produce a bust and other sculptures of the pilot for a number of USAF bases. "Classic Photographic" was described as a firm of portrait and wedding photographers with a modelling studio in France. Classic Photographic appear in the Cambridge Yellow Pages 1995 and 1997, described as photographers: "studio and location, creative and original". Lesley Harper appears in the 2000 Cambridge Yellow Pages as a specialist wedding photographer in her own name. 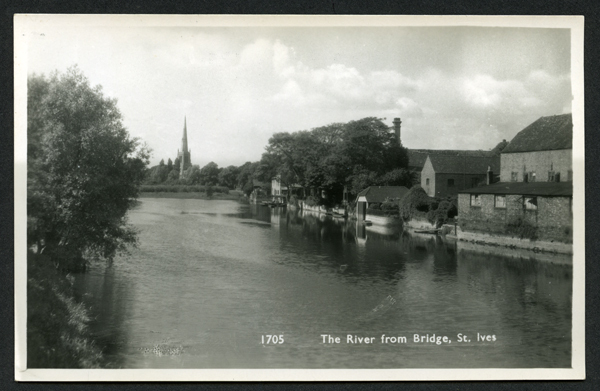 Subjects, styles, advertising, other relevant information: See below a real photograph postcard of "The River, from the Bridge St Ives" on the reverse is printed "Published by B. Clements, St Ives." Was Clements simply a postcard publisher or was he a photographer? In the Norris Museum Collection, another postcard, cat no PH/S.IVE/Pa.Chur/49 is a postcard published by Walter Scott, Bradford and added with a rubber stamp is "Clements Series, St Ives" and dated by the then curator as 1926. The 1911 census for St Ives records a Bertram Clements b. St Ives 1884, living at the Spare Rib public house employed as an assistant stationer - could this be the same person? References: No trace found yet in local directories. Subjects, styles, advertising, other relevant information: In the 1939 Register Harold is listed at the above address and his occupation is recorded as press photographer, travelling. Also at the same address were: W Lillian Clements b:1904, William Tubby b:1908 and Maggie Tubby b:1906 and Margaret M Clements b:1933. Subjects, styles, advertising, other relevant information: Is this the same Clennett from Willow Walk etc 1895-1911 - see below? Name: CLEN(N)ETT, (Charles) Ernest (Winspear(e)) b: 1859 Stockton on Tees, Durham d: 1926 Cambridge. Address: 10 Willow Walk, Cambridge. 10 Portugal Street, Cambridge from around 1910. Subjects, styles, advertising, other relevant information: Ernest came from a family of photographers. 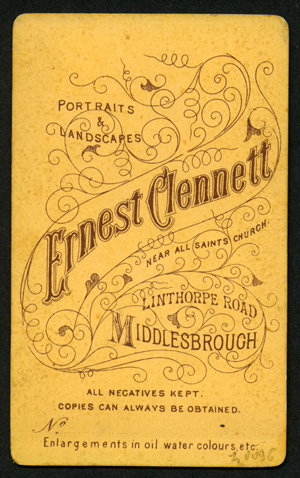 In 1871 Ernest Clennett's father, Robert Clennett, b 1835 Stockton, Durham, was at 25 and 1/2 Lynn St, Stranton, West Hartlepool, shown as a "Photographic Artist". Later, in 1891, another of Robert's sons, Arthur Clennett b:1873 West Hartlepool, was working in his father's business as a photographer's assistant. By 1911 Robert had retired and Arthur was running the family photography business. 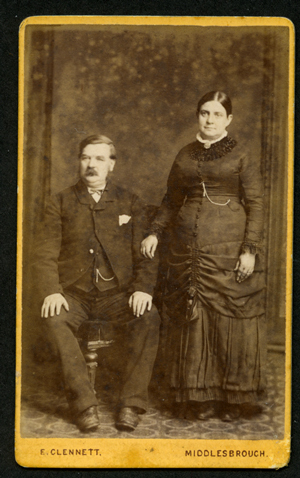 The carte de visite below (author's collection) of an unknown middle aged couple, perhaps as early as the 1870s, is by Ernest Clennett from Linthorpe Road, Middlesbrough. Presumably Ernest practiced portrait photography there before coming to Cambridge. Unusually, in the 1911 Census, Ernest Clennett's name was recorded as "Charles Ernest Wispear Clennett otherwise Ernest Clennett". "Winspear" was his mother's maiden name. In 1911 he was living with his family at 10 Portugal Street Cambridge, described as a musician, his surname spelt as "Clennett", as opposed to the spelling "Clenett" in the local trade directories which listed him as a photographer. This was obviously a musical family: the daughter, Ethel May, was a music teacher and son Philip Ernest was an organist. The 1901 Census shows Ernest at 10 Willow Walk Cambridge with his wife Martha, his daughter and then three sons - he was described as a "musician". The 1901 census entry spells his surname as "Clennett", and this has been wrongly indexed electronically as "Clemett". In the 1891 Census he is listed as "Charles Chennett", "photographer and magician", living at 7 Willow Walk Cambridge with his family. This is likely to be the same "EC Clenett" operating from nearby Lower Park Street in 1887, but a definite link has yet to be established. It is difficult to pin down Ernest's whereabouts in the 1881 census. There is no obvious trace of him in England, but he may be the "double bass player" and friend, "Ernest Clennet", staying with a Laury John Hind and Ruth Hind at 67 Cowcaddens Street, Glasgow, Scotland. Ernest's wife Martha Johnson was from Scotland. When Clennett died in 1926, he was still living at 10 Portugal Street Cambridge. His estate was then worth £3065. Clennett made numerous applications to Stationers' Hall to protect copyright in his photographs. He registered 103 photographs in the name of Ernest Clennett 10 Willow Walk Cambridge between 1893 and 1895. He registered another 23 photographs in the name of Charles Ernest Winspeare Clennett 10 Willow Walk Cambridge between 1888 and 1896. The photographs were mainly Cambridge college views and street scenes.